The combination of hydraulic fracturing (fracking) and horizontal drilling has enabled the shale “revolution.” The US is now extracting1 more oil than ever before, reversing a 38 year decline. Superficially, the industry has achieved an extraction success story. Mainstream media gush about rig counts, efficiency, and flows. 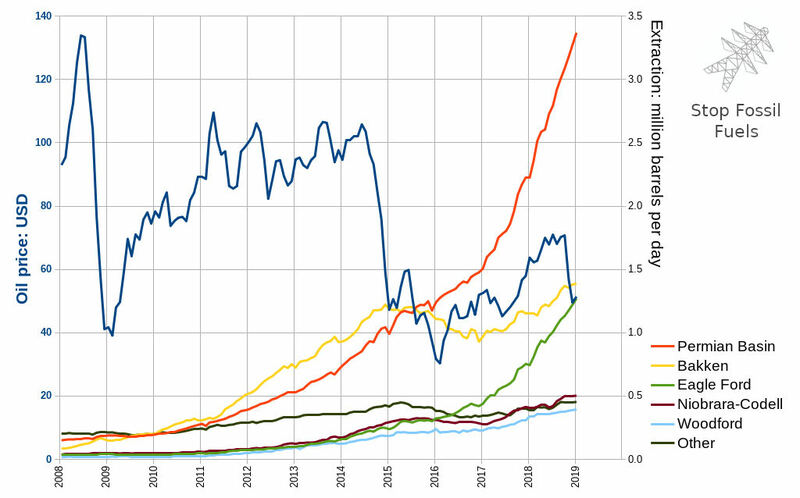 The Energy Information Administration (EIA) forecasts ever-increasing growth through 2029, with only a mild decline into 2050. Drivers assume indefinitely cheap gasoline. Politicians promise energy independence. Few realize the shale revolution wasn’t ignited solely by technical advances in drilling and busting rock. The post-2008 ultra-cheap money burning holes in investors’ pockets was equally necessary tinder—but it never kindled a fire able to sustain itself. Only by feeding billions of dollars into the sputtering flame have energy companies kept it from going out. Activists may be able to extinguish the flames relatively easily. When oil was formed under great heat and pressure over millions of years, a large part of it rose to the surface and dissipated. Some—the oil fields we have been working our way through since the 1860s—could not migrate to the surface because it was trapped beneath non-porous cap rock. Most oil, however, remained in tiny droplets in the source rock where, given time, it would eventually migrate into larger pools and either form new oil fields or migrate to the surface. 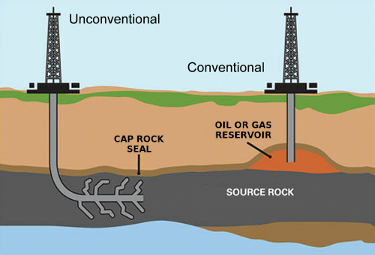 When conventional oil is recovered, engineers simply drill through the cap rock and release the pressurised oil beneath (as the pressure drops, water and later carbon dioxide is pumped in to keep the oil flowing). When a shale deposit is fracked, in contrast, engineers are attempting to rapidly complete the process of gathering oil droplets into pools. Clearly, this is more expensive than conventional drilling—far more energy goes into the recovery process, and far less oil comes out as a result. 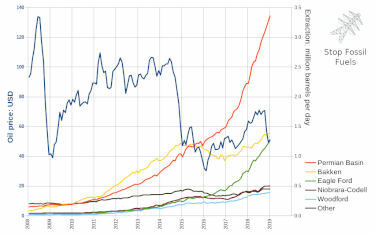 The physics of shale oil strictly limits possible payback. 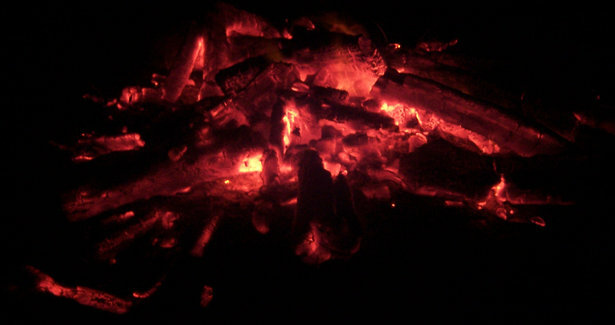 In contrast to the inferno of highly profitable conventional wells, shale extraction is a camp fire in the rain, requiring constant intervention and yielding marginal returns at best. 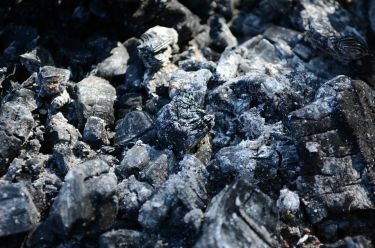 Yet few recognize that fracking makes as little energetic, economic and ecological sense as would trying to burn a rainforest to harvest charcoal. 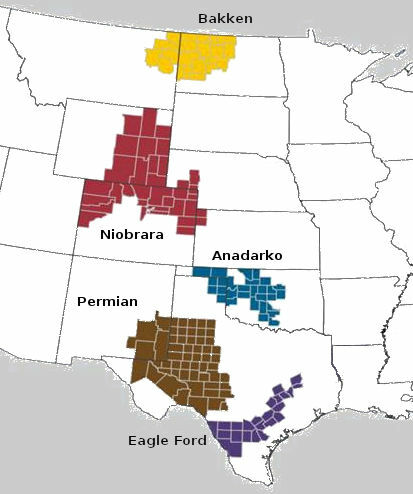 Of these areas, only the Permian Basin had significant oil output prior to fracking. Even in the Permian, the three plays accounting for nearly all the fracked oil—the Spraberry, Wolfcamp, and Bonespring—had almost no flow prior to fracking. Fracking in the Permian expanded relentlessly even through the 2014-2015 oil price crash. 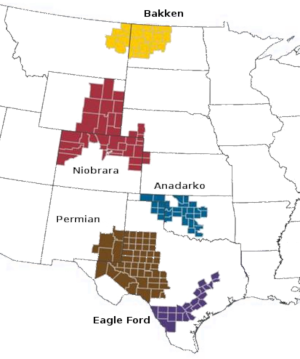 Anadarko wasn’t much affected, but in the Eagle Ford, Bakken, and Niobrara-Codell, fracking crashed in tandem with the price. Extraction in the latter two has since rebounded above their 2015 peak flows. As suggested by the Permian’s continued growth regardless of oil price, analysts consider the area to have the most potential for profit—or perhaps more accurately, the potential to burn through money the slowest. Fracking blasts open otherwise impermeable rock with explosives and a high-pressure slurry of water, chemicals, and thousands of tons of sand. Once pumps force out the oil closest to the frac zone, extraction slows to a trickle. As Post Carbon Institute’s “Shale Reality Check” summarizes, “[Extraction] from individual wells falls 70-90% in the first three years, and field declines without new drilling typically range 20-40% per year.” Companies must incessently drill expensive new wells to offset rapid depletion of the old. Since they usually develop their most productive and profitable spots first, they must drill an ever increasing number of wells simply to keep output steady. Worse yet for investors, companies are losing a staggering amount of money. From 2007 through 2018, they burned through more than $280 billion in investment cash, likely with no hope of ever repaying all outstanding debt. After the 2014-15 oil price crash, 150 fracking companies went bankrupt2 and extraction dropped one million barrels per day. Subsequent industry recovery was rekindled more by hope than by fundamentals; in the third quarter of 2018, even with oil prices touching a four-year high of $80, the industry spent nearly a billion dollars more than it earned. It can’t fund itself from product sales; it depends on “creative” accounting to attract ongoing investment. Perversely, CEO rewards and investor enchantment by high flow rates incentivise boosted extraction, even when unprofitable. The supply glut devalues oil and slashes fracking income. Profitability slips ever further out of reach. Investment community concerns have threatened to dampen cash infusions for years, but fund managers desperate for returns in the post-2008 low-interest era kept shoveling money into the fire. They seem increasingly reluctant to continue shoveling, though, and could stop at any moment. In speculative markets, fear is contagious—and since news and price signals now spread globally within minutes, a credible threat to the industry could make fund managers as desperate to get their money out as they were to put it in. As with any complex system, the shale oil industry has multiple dependencies and bottlenecks. Understanding its critical infrastructure will allow activists to maximize the impact of their actions. Extraction companies forego tens of millions of dollars in revenues per day when the discount increases in response to pipeline and refinery shutdowns. The industry is counting on completion of new pipelines to relieve the imbalance between extraction and takeaway capacity. Anti-pipeline activism would disproportionately impact profit margins where they’re razor thin or negative, and where takeaway capacity is tight. Disruption to new or existing pipelines might scare off investor funding, leaving tens of millions of barrels of oil in the ground. FracTracker tracks new pipeline projects and community opposition with which activists can get involved. Although the initial stages of drilling and breaking open the earth are mostly independent of the electric grid, ongoing extraction uses electric submersible pumps, each drawing about 300kw, ten times that for conventional wells. Regional sand mines, gas compressors, processing plants, and often pipelines add additional grid load. On the heels of rapid growth in the Bakken, Permian electric suppliers are now “struggling to keep up” with exponentially growing demand threatening the grid’s reliability. All this growth requires new transmission lines, substations, and power plants. Activist opposition to new electric projects might drive up fracking costs. Severe disruption to existing systems might trigger cascading failure within the grid, then within the oil and gas infrastructure dependent on the grid, and ultimately in the financing of new frac wells. Without frac sand, drillers can’t initiate flow in new wells. A single well can consume thousands of tons of sand, making it one of the largest costs. Unavailability would shut down drilling altogether, and even attrition driving up the price could help push companies into bankruptcy. A single frac well can consume millions of gallons of water, vomiting out nearly the same amount of polluted wastewater. Even a small increase in cost per gallon to source or dispose of water would significantly impact a well’s bottom line. However, both sourcing and disposal seem to be distributed, without obvious bottlenecks. Drillers buy water from any of a myriad of public and private sources. On the other end, some wells do transport their wastewater to centralized treatment plants, so disruptions to those plants might increase disposal costs for some wells. But the great majority4 of waste is injected into the nearly 40,0005 Class II disposal wells across the US, offering little scope for strategic intervention. The price for which frackers can sell oil depends not just on proximate takeaway infrastructure, but also on the capacity of refineries and ports at the receiving ends of pipelines. If shale grows as expected, then refineries will be overwhelmed, necessitating export of millions of additional barrels of oil per day. Activists might depress the value of fracked oil by challenging increased tanker traffic, or by shutting down refineries or Very Large Crude Carrier loading sites. Usually, only decisive failure of a critical system component can trigger cascading failure, but with the shale oil industry already so financially precarious, it may be vulnerable to even a sprinkle of attrition. The more financial uncertainties raining down, the more likely they are to douse its flame, but even a small splash could scare off skittish investors still feeding the blaze. Under these circumstances, actions normally falling under attrition may actually win decisive victory. Nonetheless, activists should apply the principles behind the strategy of cascading failure. Protests and direct actions would be most effective if they took the offensive, targeting operational infrastructure with surprise actions of short duration, then dispersing before security forces could assemble. Natural disasters or activist intervention affecting pipelines, the grid, refineries and ports, or rail and truck transport of oil and sand could interrupt industry profits, rattling investors. Prolonged disruptions could culminate in no financing of new frac wells, and consequently fields declining up to 40% each year. If disturbances also forced curtailment of operational wells, the fall-off would be even steeper. Extinguishing the already sputtering flame of shale oil could be one of the most strategic ways for US activists to stop fossil fuels. Let’s get to work. “Finances of Fracking: Shale Industry Drills More Debt Than Profit”—DeSmogBlog series by Justin Mikulka and Sharon Kelly. Several articles from this series linked above, but the entire series is worth reading for deeper understanding.